The separation of the American colonies from the English rule started approximately 1.5 centuries after the founding of the first permanent settlements in Virginia in 1607. By this time the colonies had grown immensely both economically and culturally. The conflicts between America and Britain seemed to deepen gradually in time. Although the settlers were inclined to stay loyal to the English king that had sent them, there were several objective reasons that inevitably led the American people to the recognition of the need for separation and independence from the Crown. These reasons were both political and geographical. An island cannot rule a continent! First of all, it is important to realize that Britain had difficulties in governing America not only because of its distance from the mother land but also because of its immense size. At the time the first settlements were established on the American continent, England probably could not anticipate the problems it was going to face governing the land a century and a half later. Because of the remoteness the ties between England and America were loose. As more and more people traveled to America and were given a chance to build up “a new world” for themselves, the American communities grew mainly on their own and they managed to take care of themselves quite well. Since Britain was busy at home having wars with its neighbors, the Parliament did not have time for the colony so far away from home. In time the colonies became economically strong and developed their own culture. After dozens of decades of self-government behind them they had accustomed to a large measure of independence. When Britain finally “woke up” and realized that America had grown strong, it seemed to be late already. The image of America as a standalone territory had already been crystallized in people’s minds. Secondly, the politics the British government applied in an attempt to regain control over America did not seem to serve the purpose. The Crown came into conflict with the interests of the colonies in many different ways. The colonies increasing in the population and needing more land for settlement claimed the right to extend their boundaries. The British government, fearing that settlers migrating into the new lands would provoke a series of Indian wars, believed that the lands should be opened on a more gradual basis. By restricting movement England also wanted to ensure control over existing settlements. The colonists considered such policy as a disregard of their most elementary right to settle western lands. Another political issue, which became a source of conflicts between the two sides, was the new financial policy of the British government. In short, it was called “taxation without representation”. Several taxes were placed on the colonists which would extract revenues to supply money for England’s administration. These taxes were enacted by the Parliament and were ruinous to the colonists’ businesses. The Molasses Act of 1733 placed a tax on the import of rum and molasses from non-English areas. The Sugar Act of 1764 went even further and forbade the importation of foreign rum and put a duty on molasses from all sources as well as levied duties on wines, silks, coffee etc. The Currency Act of 1764 prevented paper bills of credit from being made legal. The Quartering Act passed in 1765 required colonies to provide royal troops with provision and barracks. All these caused alarm among the American merchants. The last of the measures in establishing the new colonial system was the Stamp Act which triggered the movement of organized resistance since it had a great influence on the most powerful groups of the American population. As a result non-importation associations were formed to boycott the economy of England and the trade with the mother country decreased sharply. Enacting the hated revenue stamps caused some of the first violent rebels against the English order. The taxation without representation in the Parliament was considered a threat to colonial liberties and in October, 1765 the Stamp Act Congress was held in New York which adopted a set of resolutions declaring that the Stamp Act subverted the rights and the liberties of the colonists. The aim of the colonists was for the Crown not to violate their basic rights but treat them fairly in terms of economic and political status. From the colonists’ point of view, it was impossible to consider themselves represented in Parliament unless they actually elected members to the House of Commons. But this idea conflicted with the English principle of “virtual representation” according to which each member of Parliament represented the whole country. In 1766 Parliament repealed the Stamp Act but not because of the colonial contentions, but rather because of the British merchants who suffered the effects of the American boycott. So the Parliament never really took into account any of the colonists’ appeals which arouse disrespect towards the “foreign rule” in the people’s minds. As more and more restricting regulations were passed on the people of America, they were at times provoked to violence. There was an incident in Boston in 1770 which resulted with three Bostonians killed by the British troops. The incident was seen as a proof of British cruelty. Shortly after, in 1773, another incident took place which showed the world that the Parliament had no control over colonies. The tea cargo of three British ships was dumped in the port of Boston by a band of men led by Samuel Adams. Adams was the leader of radicals whose primary goal was to free people from their social and political superiors. His final objective was the independence of America. Under his command “Committees of Correspondence” were set up virtually in all colonies which later became effective revolutionary organizations. The Boston “Tea Party”, as it came to be known, was followed by the punitive measures from the Parliament – the Coercive Acts which set further restrictions on the development of the economy including the closure of the Boston harbor until the tea was paid for. It is clear that the British policy towards America was rather harsh. England seemed to have been well satisfied with the revenues coming from the colonists but it did not possess the ability nor the proper attitude to solve their problems. The way England’s policy handled the affairs with the colonists shows that the Crown never wanted America to prosper for its own benefit in order to prevent it from becoming too powerful, it did not really care as long as the profits from the colonists kept coming in. As the conflict grew deeper and the idea of independence matured in the consciousness of people, it created perfect conditions for a revolution to break loose. All in all, in the historical sense the separation of the American colonies from England seemed inevitable. It was only a matter of time. The Declaration addresses directly to the critical situation in the colonies. To fight for American independence was to fight for a government based on popular consent in place of a government by a king who had combined with others to subject American people to a jurisdiction foreign to their constitution and unacknowledged by their laws. Only a government based on popular consent could secure natural rights to life, liberty and the pursuit of happiness. 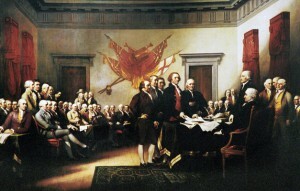 Thus, to fight for American independence was to fight on behalf of one’s own natural rights. Patriotism is love and devotion to one’s country. The word comes from the Greek patris, meaning fatherland. The European people derive their patriotism from the fact that they have common forefathers, share the same blood and belong to the same nation, whereas Americans don’t. At some point they have all been immigrants from different areas of the world. Yet, American people are considered very patriotic. For instance, it’s difficult not to notice how they use the elements of the US flag in all possible places and situations. How come? If it isn’t flesh and blood that unites them, then what does? Although this great nation lacks common blood and kinship, they share the common idea of the American dream, the dream outlined by the principles formulated in the founding documents and the symbols that represent them. It is claimed that the man responsible for the invention of America was Benjamin Franklin, one of the Founding Fathers of the United States and signers of the Declaration. Today the most sacred attributes of the American patriotism are the Declaration of Independence, the Constitution, the US flag and the Pledge of Allegiance. It is interesting to note that there are several very strong indications of America having been founded on Biblical belief and you don’t have to look very far to find them. 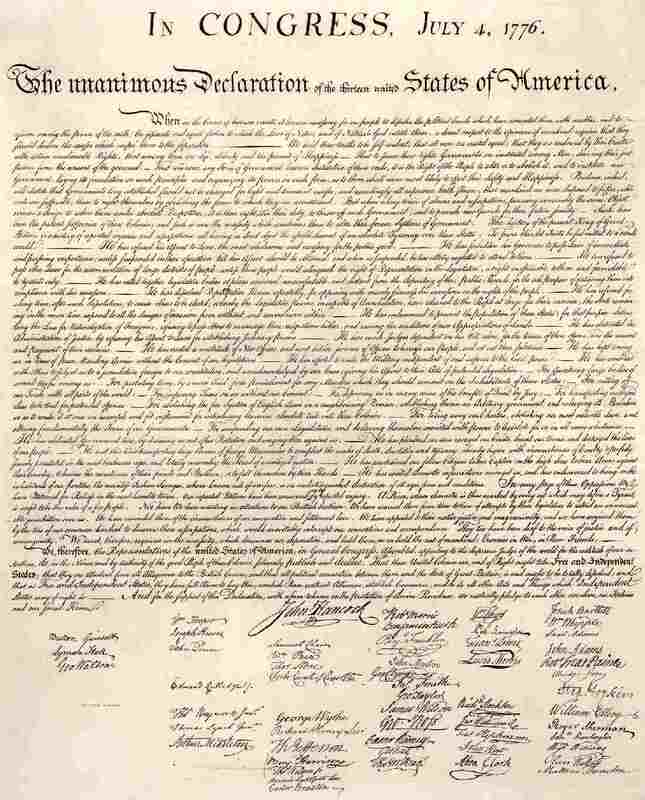 The first one is found in the Declaration of Independence: “We hold these truths to be self-evident, that all men are created equal, that they are endowed by their Creator with certain unalienable Rights …”. Another indication can be found in the Pledge of Allegiance: “I pledge allegiance to the Flag of the United States of America, and to the Republic for which it stands: one Nation under God, indivisible, With Liberty and Justice for all.” And of course, we all know and have seen the official motto of the United States which also appears on the dollar bill, “In God We Trust”. So, is it a Christian country? You do the math. As stated, a great number of Americans believe that America’s strength lies in the principles outlined in the founding documents such as the Declaration of Independence, the Bill of Rights and the Constitution. The United States Constitution is the oldest written constitution still in use. This document has a central place in United States law and political culture. However, many Americans today, more than 200 years later, express a great concern about the alarming trends that have been gaining more and more ground in the US in recent decades, but most prominently after the last elections. It seems that America is on the road of abandoning their most sacred principles formulated by the founding fathers. The news about the internal turmoil and the silent drift for worse doesn’t seem to make it across the Atlantic so easily. But once you get to know the issues this vast country is experiencing, you’ll start seeing the situation in America in a whole new perspective. So, unfortunately, things aren’t looking very good, are they?. If it gets really bad, it’ll definitely have some serious consequences in the entire world (including Estonia) as the power balance shifts off. Should America lose its economic predominance and the prevalent position as the stronghold of freedom and democracy, there probably wouldn’t be much freedom left for poor Estonia either. 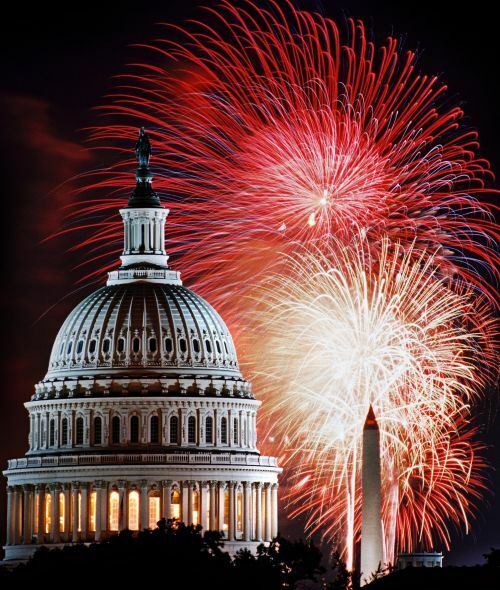 Today the American citizens take pride in celebrating the Independence Day of the United States of America on July 4, the day the Declaration of Independence was adopted in 1776. I often had the chance to criticize US and, seen how economics is doing, I believe my negative attitude towards stars and stripes is not going to change anytime soon. Although my life standards are fantastic -also- thanks to what America did to our societies, the way it let itself go in the hands of Asians economies shows the limits of a system that committed a slow, painless but tremendously effective suicide. Jose, you’ve been blinded by that very light! You are borderline at best. “…that all men are created equal…” Come on now! Some are definitely created more equal than others. I get what you are trying to say, but you missed by a mile I dare say. Lets’ call a spade a spade. First, you carried on with enslaved workers until the Civil War. Then Afro-Americans could not vote until the 60s’ after they had to burn down your cities i.e. “black days in July…”. Did I mention complete segragation in the south which still occurs to this day in some places, its understood, believe me. If you are black, have you played 18 holes at Augusta lately??? Do ya think they’d let the President play through? How about the KKK? I’ll bet they are just under your radar abiding their time. Do you let blacks or other colours into your gated communities? How’s Rodney King doing? You call all of that a Christian country? I don’t think so! I know, it ain’t perfect but its all you’ve got! In my opinion, too often some religious groups(and not all people within it) have subverted our secular society and Constitution for far too long by injecting their religion into it. They see that islam is growing more rapidly and starting to make a larger foothold in the USA, and due to their precedents (swearing in on a bible, one nation under god, etc.) they are fearful of Islam doing the same as I am as well. However, in my eyes, and I’m pretty sure I’m not alone, sharia law is no better than some self-serving hypocrite christians telling me what to do. Don’t believe me? In the words of a wiser man than me, “Can you buy beer on Sunday in your town and bring it to Adam and Steve’s wedding reception?” Now christians are running scared and true to form spreading hate and lies about others. Good day. Keep on blocking my posts! We know the truth and what you say is the very same reason why we left the christian oppression. Keep spreading the lies, the American people are better then your false hopes of perverting the Constitution. Why are muslims the target of hate and profiling these days? well the christians have warped the founders thoughts and words to inject their religious beliefs and now these same christians are running scared for they set the precedent to inject religion into our secular nation. For full disclosure I abhor any cult that indoctrinates youth into their false ideology and try to warp our great forefathers and Constitution to their will. The American people are smarter then this. No-one is blocking anything. I personally am convinced that many of the forefathers were deeply religious people and followed the principles of the Bible on daily bases, not just on Sundays in front of an audience. There’s evidence of that if you care to look at some of their correspondence. Believing was a rule back then, not an exception. The United States was founded in this context and, let’s not disregard the fact, it prospered. The decline of the US matches the time the majority of the society started to show signs of becoming secular and elected people from among themselves who were strangers to the teaching of the Bible. Your claim that the society is secular now is true. So is the decline. I suspect the two might be connected. Now Islam is starting to fill in the gap. And there’s no telling what change it will accommodate. Perhaps we should ask this question: are you happy with the way things are in the US and the trends currently taking place? I’d say most people are alarmed. People want things back the way they used to be. Instead, the Change is taking over and leading the nation to the unknown. My apologies on the blocking comment, it was apparently still awaiting moderation. The only thing that christians use in the defense of saying our nation wasn’t secular from the get-go that was stated by our founders was, “We hold these truths to be self-evident, that all men are created equal, that they are endowed by their creator with certain unalienable Rights …” This is a very ambiguous statement that can be used by any religion or nonbelievers, such as myself for example. My parents were my creators. The other two examples you used were injected by christians which is frankly, un-American and flies in the face of what our forefathers intended. That can be unequivocally proven if people research the correspondence between our founders, and not just pick and choose what they wish to believe. Yes, Islam is growing and would not have been a problem had other religions not set the precedent of injecting religion into the state. Palin and this tea party movement are out of their minds. They very want to prevent acting like Obama is bringing the top of the planet upon us. I foresee some kind of revolution if this keeps up, maybe not necessarily a violent one particular, but some kind of dramatic shift. I have to agree with Cy, the christian coalition have been eroding our founding fathers beliefs and perverting them for their own self serving principles for a very long time. Yes our founders mention a creator, but that was as far as they would acknowledge a potential higher power in any document such as the Constitution or Declaration of Independence. The simple truth is that later on in our countries lifespan was the words “In god We Trust” added to our currency and the phrase “one nation under god” added to our pledge of allegiance during the McCarthy era witch hunts. Those two acts were the most belligerent acts of defiance against our founders principles and the Constitution of the USA. Maybe we don’t need a revolution but a redress of our government as stated in our Constitution back to the basic principles stated in said documents. To address the people who have agreed with this blog, please study history we are not and were never a christian nation. 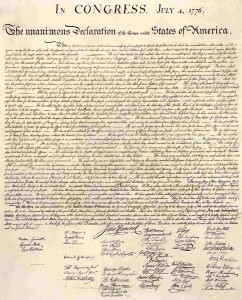 Start with the First Amendment to the US Constitution : Congress shall make no law respecting an establishment of religion, or prohibiting the free exercise thereof; or abridging the freedom of speech, or of the press; or the right of the people peaceably to assemble, and to petition the Government for a redress of grievances. I love how people try and pervert this very easy to grasp phrase, but than again those same people pervert/change the bible according to their whims. The problem with that is most Americans aren’t ignorant(I can dream). Richard, I can’t help noticing your discontentment and even hatred against religion in general and Christianity in particular. Is there a reason for that? Might I remind that religion has always been there throughout history and to consider the people of the past times ignorant and this generation somehow superior because of finally being able to distance themselves from beliefs and religious principles would in my opinion be rather narrow-minded. It doesn’t make sense to get upset over something that has prevailed since the dawn of civilization and blame everything on it. Massive disbelief and atheism are the headwords of the last century only. They match the time of the emergence of the industrial revolution and the mindless consumption by the western world which is the very source of most problems mankind is facing today as the planet that nurtures us gets thrown into a trash can in the process. People have gone mental in how much they’re able to consume. In this sense America is top notch, US national dept surpasses the entire world’s GDP. The superpowers and top politicians can’t agree on terms of preserving a sustainable planet since they’re too busy claiming more and more political and economic influence and there are no other criteria except the one just mentioned that would keep them on track. This world is doomed because all people care about is their own ideas of momentary (lifelong) well-being which justifies stepping on thy neighbor should they come in the way. A man needs to have faith into something greater than himself to become a better man. Otherwise it’s just a life wasted and probably many others ruined. Or, at least that’s what I personally believe. The reason I abhor religion is from the corruptness and indoctrination of pure young minds, and in particular the attempt by religions to do the same to me. Yes religion has been around for a while, lying, brainwashing, perverting, murdering, slaving people, all disguised as for the betterment of the individual and society as a whole. While it may not make sense to you to get upset over something that has been around for far too long that you believe in, it makes perfect sense to a free mind. Don’t blame free minds for the problems handed down from warped minds. Are you assuming I consume too many things? Because I’m am very much a conservative in the strict sense of the word, I grow almost everything I eat, haven’t gone clothes shopping in years, drive a 1986 D10 CUCV that I repair all myself(just repaired a blown head gasket last week). Please don’t pigeon hole me into your nice idea of some gluttonous atheist. No one needs religion to become a greater man, and as far as not being a religious person can ruin your own life and “PROBABLY” others, well, that sir is as ignorant as you can get. Remember that when you proselytize for your cult and warp others futures. That’s what a free mind thinks. I will. Meanwhile, a little tip for you, too. For my unfree mind your free mind sounds a little too bitter. I doubt if people are buying your message of free minds unless you start sounding more free of bitterness and accusations against everybody who has ever lived. And since this conversation isn’t going anywhere, there’s no point continuing. Well I’m not attempting to sell any point of view, just spreading the truth. You can continue to spin it however you wish. To think that I am throwing accusations towards everyone who has lived, would be to assume everyone believes in the lies sold for the small pittance of the “salvation of their soul.” I also had time to think about my last post and started to wonder why the so-called bible belt of the USA is also the fattest in the USA, and has been for a while. It must be an adjustable belt. It is just like the bible thumpers to dismiss the sin of gluttony as they would dismiss the truths within the Constitution of the USA. I’m sorry if you think I am bitter, but when an outsider tries to tell a true American how to comprehend our own Constitution through lies and propaganda, well, it makes me kind of sad. I will concede on one point, this conversation is going nowhere. Have a great day, and I hope you get a chance to visit our great secular country! I just wanted to say a few things to you before we end this. First of all, I liked the tone of your last post much more than the previous ones. Secondly, you are completely right about the point that I am an outsider to your society, however, it hasn’t been my intention to ‘tell’ true Americans anything, I’m just expressing my concern according to my own belief and understanding, which, I guess, should be okay. I represent my point of view as you do yours. It’s just that the topic of this particular post relates to the issues you “live”, whereas I’m just observing from a distance. But this doesn’t mean I can’t have ideas about the matter. Basically, it’s about toleration of a multitude of opinions, sth that a free mind definitely thinks is okay. Thirdly, I want to thank you for taking the time to even bother to read and comment on this blog (of an outsider). And I guess, the last thing I’d like to say is that we can go on with this argument forever probably without either side having a slightest chance to actually prove anything. In the end it just boils down to the simple matter of what you and I believe. And I’m not going to say anything more not to trigger another argument. Have a great day. Well the problem with that is you are ignoring facts and just stating what you would hope for. I also have to address another earlier question you posted about what direction my country is heading, and no I don’t like it. That’s the very reason I’m arguing for the separation of church and state as intended by my country’s founders. This is not a matter of belief but fact, and the religious leaders have ignored this for far too long in order to subvert our country. Quite frankly these uppity folks need to look in the mirror, lead from example and quit shoving their beliefs down a once great countries throat. So please keep up the notion that this is what I believe as if we are equals, we are not, I base my truths upon fact and history, not ideologues and faith. Oh and by the way, I have no problems with peoples opinion as long as they don’t use an opinion as truth, when it is laughably not truth, to indoctrinate others into that said opinion. Is it coincidence that you left out one of the main driving factors for the colonization of North America? Religious oppression. No matter how many times cults try to ignore simple truths, and ignore history by stating their “interpretation” of the facts many more will be there to call you out. Just saying it over and over doesn’t make it so, although this is commonplace in brainwashing schemes.